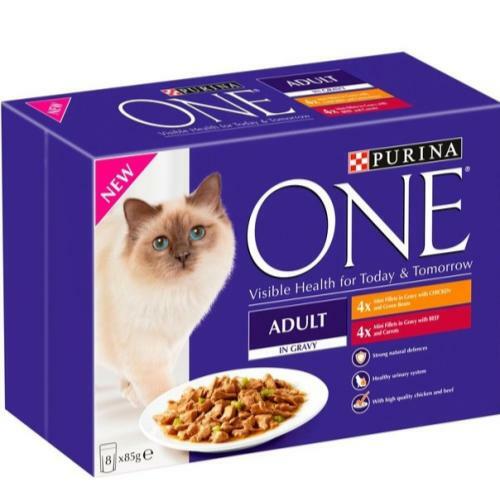 Purina ONE wet meals has been developed by Purina Vets and Nutritionists to give high quality nutrition and tasty recipes for your cat. Made with chicken or beef for protein, rich in vitamins and minerals to support vitality and keep natural defences strong with antioxidants such as Vitamin E.
The added fibre is proven to help the digestive system and the minerals will keep the urinary system healthy by helping to reduce the concentration that may lead to urinary stones. These complete balanced recipes of tender mini fillers, and vegetables in delicious gravy will keep your cat happy and full. Meat and animal derivatives (of which chicken 8%), vegetable protein extracts, vegetables (5% from dried green beans), fish and fish derivatives, derivatives of vegetable origin, minerals, oils and fats, various sugars. IU/kg: Vit. A: 995; Vit. D3: 135; Vit. E : 250 mg/kg: Taurine: 430 ; Fe (E1): 29; I (E2): 0.56; Cu (E4): 3.6; Mn (E5): 5.1; Zn (E6): 70; Se (E8): 0.047. For an average cat of 4kg, feed 3 to 4 pouches per day in at least 2 separate meals. The recommended daily amounts should be adjusted to weather conditions, cat’s level of activity and its physical condition.